The Conventicle Act of 1593 lasted for just one parliament and allowed for the imprisonment without bail of those over the age of sixteen who failed to attend Church; who persuaded others to do the same; who denied Her Majesty's authority in matters ecclesiastical; and who attended unlawful religious conventicles. 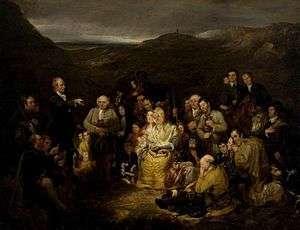 The Conventicle Act 1664 forbade conventicles (five or more people, other than an immediate family, meeting in religious assembly outside the auspices of the Church of England). This law was part of the Clarendon Code, named after Edward Hyde, 1st Earl of Clarendon, which aimed to discourage nonconformism and to strengthen the position of the Established Church. The Conventicles Act 1670 imposed a fine on any person who attended a conventicle (any religious assembly other than the Church of England) of five shillings for the first offence and ten shillings for a second offence. Any preacher or person who allowed their house to be used as a meeting house for such an assembly could be fined 20 shillings and 40 shillings for a second offence. Many Calvinists, however, held that the only "true" church was a voluntary gathering of believers and that, therefore, it was the official parish churches of the Church of England - which offered the sacraments even to sinners and "Papists" - that were the false churches while an officially illegal conventicle could be a true church. The growth of conventicles is closely related to Pietism and the Charismatic Movement. In the American Lutheran Church, in particular, there has been considerable debate about conventicles stemming from 17th and 18th century Pietism. Thompson attributes today's Lutheran mission societies, ladies societies, youth groups, Bible studies, group devotions beyond actual church services, Lutheran elementary schools and high schools, and charitable and fraternal organizations associated with the church as all forms of conventicles. According to C.F.W. Walther, the founder of the Lutheran Church-Missouri Synod, such movements had to be opposed or carefully monitored, a caution that remains in effect. ↑ Elton 1982, pp. 458-61. ↑ Lodge 1923, p. 69. ↑ Raithby 1819, pp. 648-651. ↑ Noorthouck 1773, pp. 230-255. ↑ David Kaufman (1999). Shul with a Pool: The Synagogue-Center” in American Jewish History. Hanover, N.H.: University Press of New England. P. 168.